Internal Combustion for the future generation! 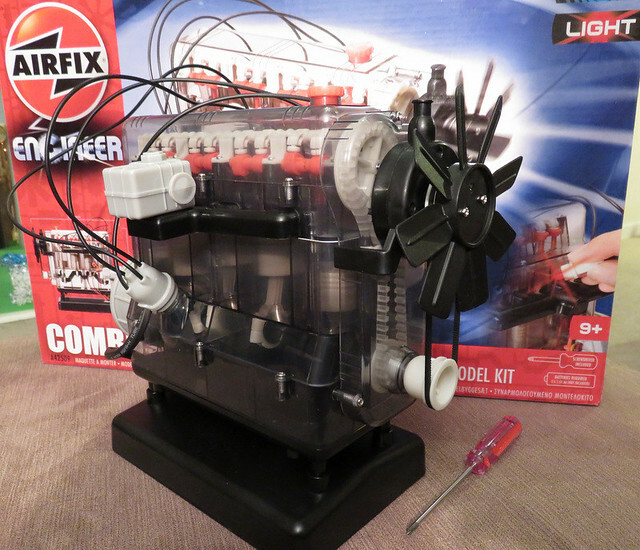 Last Christmas my Son was given an Airfix kit for an Internal Combustion Engine, and last weekend we finally got around to building it. It's a pretty big box, and like all Airfix kits, is full of plastic moulded parts - the smaller ones on sprues. We found a pair of side cutters ideal to remove them. Also included is a pack of screws and a screwdriver for assembly, no glue required for this kit! Most of the parts assemble and work in the same way as in a real engine, which is both educational and exciting, the engine block is clear while some parts are moulded in different colours so they can be seen operating. 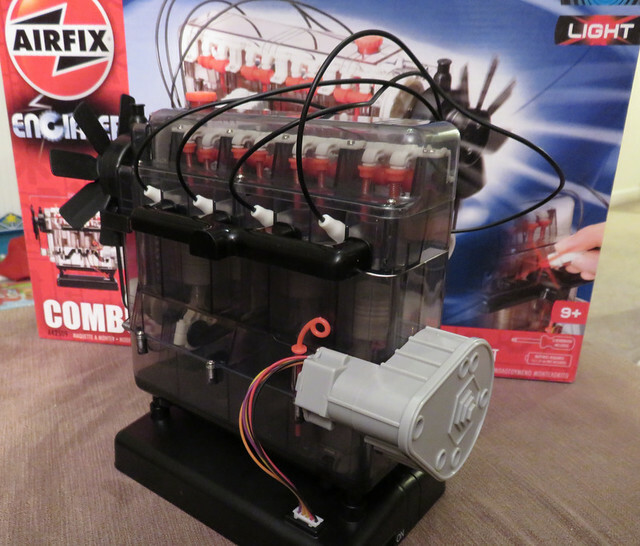 The engine stands on a base containing batteries and a speaker for the sound effects, while round the back there is a motor fitted as a starter/flywheel assembly to turn the crankshaft and make the bits go round. There are also "spark plugs" which flash at the point of ignition. Assembly took a good couple of hours which my Son seemed to enjoy, judging by his enthusiasm, and he was rather proud of the result. The instructions are straightforward and include a good explanation of what the parts represent, and how the real engine works, while for the most part the kit seemed very well designed and made, although the screws (which are self-tapping) were rather stiff to put in, and I had to help tighten them using a slightly larger screwdriver. However, the spark plugs are not marked for which cylinder they should go in, meaning they could be assembled to flash at the wrong point in the cycle. This seems odd given the detail of the design of the kit elsewhere, for example the cams are marked for position and orientation and slide onto a D-section camshaft so they work correctly, while other parts had to be correctly aligned to slide onto their shafts, there is even a "timing tool" to ensure crank and cam shafts are correctly phased. Since engines are my business I looked to see when the front (No. 1) cylinder was at top-dead-centre firing and inserted the plug that flashed then, and seeing the model followed convention of 1-3-4-2 firing order, inserted the rest in turn to match. Nonetheless, it's an impressive kit that's a must for all young aspiring engineers and petrol-heads. But you want to see it working, don't you?